I used the German Chocolate frosting recipe from My Cup of Cake for the filling and Martha Stewart's Caramel Buttercream Frosting recipe. The filling mixture usually takes about 15 minutes to boil; after that, it will thicken enough to use in the cupcakes. 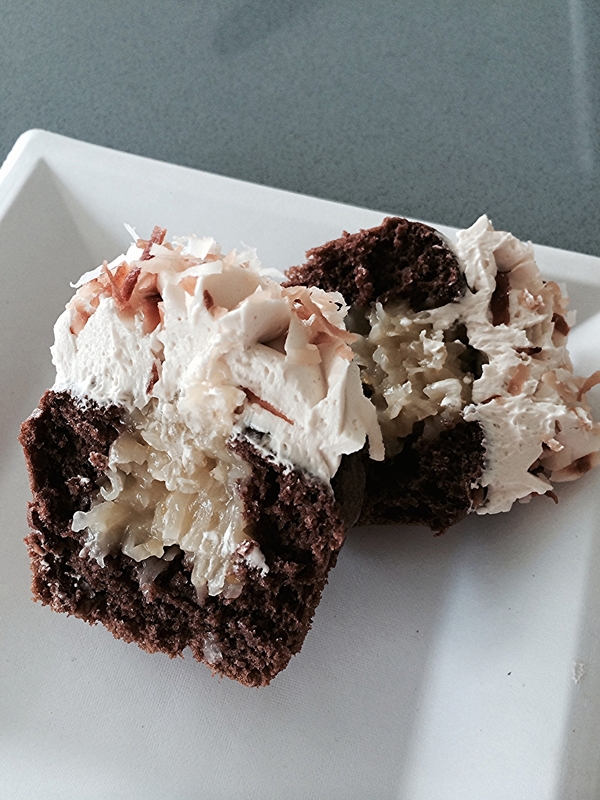 I used toasted coconut as a light garnish on top of the frosting. It made it more obvious that the cupcakes were German Chocolate (since you can't see the filling) and added some nice color and texture to the cupcake. I've seen many German Chocolate cupcake recipes call for what I used as filling as the primary frosting. I haven't tried that because I know how dense the German Chocolate filling is and don't want my cupcakes to topple over from the weight of the frosting. Besides, you can't really go wrong with filled cupcakes. In medium sauce pan, combine evaporated milk, sugar, egg yolks, and butter. Stir constantly over medium heat until thickened. Stir in vanilla extract, pecans, and coconut. Let cool. Switch to paddle attachment. With mixer on low speed, add caramel, and beat until smooth, 3-5 minutes. Pipe onto cupcakes (open star tip recommended). Garnish with toasted coconut (as shown).